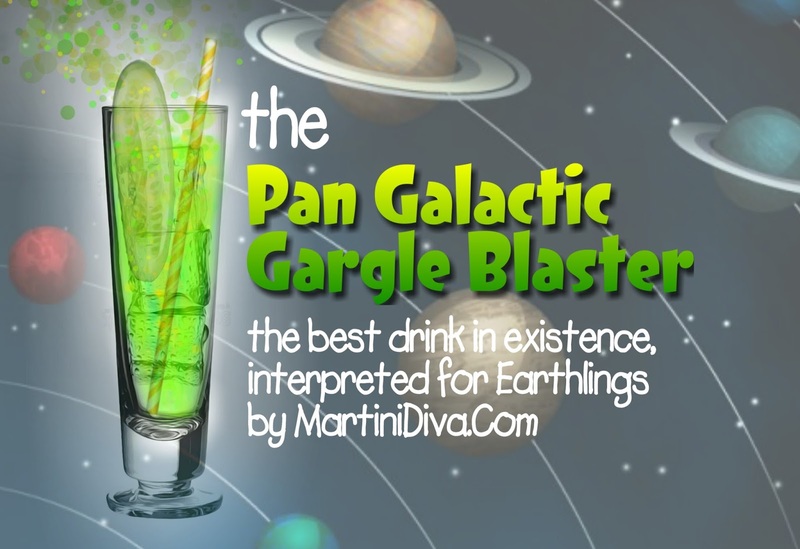 According to Douglas Adams' The Hitchhiker's Guide to the Galaxy a Pan Galactic Gargle Blaster is "like having your brains smashed out by a slice of lemon wrapped around a large gold brick." It was invented by the ex-president of the Universe, Zaphod Beeblebrox, and is said to be the "Best Drink in Existence." Beeblebrox himself advised "never drink more than two Pan Galactic Gargle Blasters unless you are a thirty ton mega elephant with bronchial pneumonia". Though it cannot be truly replicated on Earth I had to give it the old Arthur Dent try. 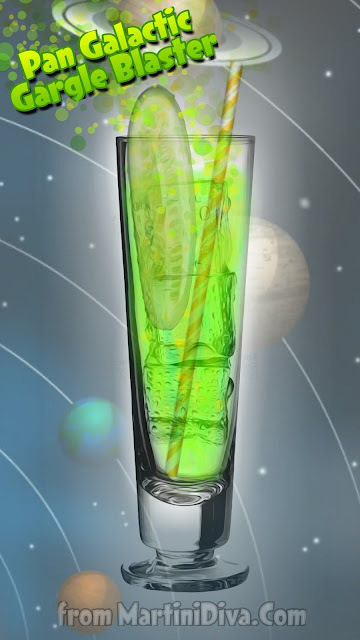 It was an interesting experience as I attempted to substitute earthly ingredients for galactic ones and still come up with a good cocktail recipe that an earthling could enjoy. Both versions are below with my human interpretation annotated with my reasons for my substitutions. The PAN GALACTIC GARGLE BLASTER NON EARTHLY MIXING INSTRUCTIONS (directly from the book): "Take the juice from one bottle of Ol' Janx Spirit. Pour into it one measure of water from the seas of Santraginus V (Oh, that Santraginean seawater! Oh, those Santraginean fish!) Allow three cubes of Arcturan Mega-gin to melt into the mixture (it must be properly iced or the benzene is lost). Allow four litres of Fallian marsh gas to bubble through it, in memory of all those happy hikers who have died of pleasure in the Marshes of Fallia. Over the back of a silver spoon float a measure of Qualactin Hypermint extract, redolent of all the heady odours of the dark Qualactin Zones, subtle, sweet and mystic. Drop in the tooth of an Algolian Suntiger. Watch it dissolve, spreading the fires of the Algolian Suns deep into the heart of the drink. Sprinkle Zamphuor. Add an olive. Drink... but... very carefully..."
Add 3 Large Ice Cubes to a chilled cocktail glass. Enjoy your drink and DON'T PANIC, one or two of these aren't "the alcoholic equivalent to a mugging; expensive and bad for the head."